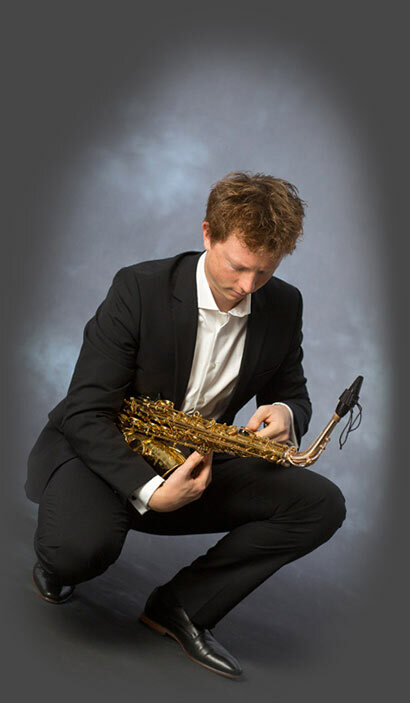 LARS NIEDERSTRASSER studied at the Conservatory of Amsterdam with Arno Bornkamp. He also took lessons with Claude Delangle at the Conservatoire Nationale Supérieure de Musique de Paris during an Erasmus exchange. After winning eight first first prizes in the national competition Jugend musiziert Lars made his Concerto debut with the Bochumer Philharmoniker performing the Glazunov Concerto at the age of 18. He also performed as a SOLOIST with among others the Braunschweiger Staatsorchester and the NDR Radio Philharmonic Orchestra. He plays soprano saxophone in the BERLAGE SAXOPHONE QUARTET. They won the renowned Dutch Classical Talent Award 2013 at the Concertgebouw in Amsterdam and the Kersjes Prijs 2015. At the German Music Competition 2011 in Berlin, the Berlage Saxophone Quartet won a scholarship and was included in the national selection of the Young Artists Concerts. In 2014 they released their Debut CD SaxoFOLK at the MDG label followed by In search of freedom in 2017. With the German saxophone orchestra SELMER SAXHARMONIC where he is playing bass saxophone, he recorded “Flying Saxophone Circus” under the direction of Milan Turkovic. The CD won an ECHO Klassik Prize. From 2007-2012 Lars played with in the Schleswig Holstein Music Festival ORCHESTRA. Furthermore, he plays in orchestras such as the Royal Concertgebouw Orchestra, the Dutch Radio Philharmonic Orchestra and the Essener Philharmoniker. CONCERT tours led to the United States, Japan and throughout Europe and Lars made RADIO RECORDINGS for the Radio 4 (NL) the ORF (A) and the Deutschlandfunk, NDR and BR (D). In 2014 he published his solo CD with works by J.S. Bach, Carl Philipp Emanuel Bach and Marin Marais and featuring also the Four Baritones (Baritone Saxophone Quartet).